I’ve been meaning to post on my new holster for a while now, but have been really busy with other stuff. For years now since I got my CHL I’ve been using a Fobus Paddle holster to carry first my Walther P99 and later my Springfield XD. Obviously I liked the holster a lot because I went and bought a new one when I got a new gun. But everything wasn’t sweetness and light. The Fobus holster actually holds the gun away from your body a good bit. And of course it is on your belt so the gun is visible both above and below the belt line. Also if you want to conceal the gun, you have to wear clothes that cover the gun. So my carrying dictated my fashion style. For years I’ve worn a lot of untucked shirts to cover my gun and had to worry everytime I bent over or stretched. And nothing too tight. When I lost some weight and wanted to wear a tighter shirt, I couldn’t and carry at the same time. Printing was a problem. 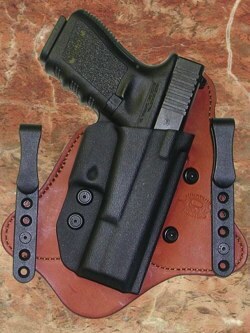 I’d thought about getting a Inside the Waist Band (IWB) holster for years but haven’t done it for one reason. Your pants have to be bigger. About a belt notch bigger. Well my recent loss of about 20 pounds meant all my pants are too big. So it was time. Here’s a way to test out if an IWB is for you. Unload your gun and stick it in your waist band at your hip. Now try walking around and sitting with it. This will show you how the gun sits on your hip. You’ll see the leap in concealability as well. I found it was comfortable for the way I moved and sat. Doing a little research online I knew the features I wanted from my holster. A sweat guard. This means the holster’s leather comes all the way up the gun to keep the metal off your skin. In Houston I didn’t want metal next to my skin. Tuckable. Turns out some IWB holsters actually allow you to tuck a shirt in over them. They do this by attaching the hooks for the belt to the bottom of the holster instead of the middle. Then you just push the fabric between the gun and the belt of your pants. And yes it slows the draw a little, but not much more than an untucked shirt. One hand reholster. If you draw the gun, you need to be able to put it back in the holster with one hand. If the holster isn’t rigid enough you have to hold it open with one hand and put the gun back in with the other. One handed reholster is accomplished one of two ways. Either a rigid material is inside a leather holster, or a kelvar holster is attached to a leather backing like the one pictured. As thin as possible. Thinness is listed last because it isn’t as important to concealability as you think, but it is still a factor. I had bought new shorter belts after the weight loss and now can’t use them if carrying because they are too short. So it is something to consider. I went to the local gun show but no one was selling IWB holsters so I ended up ordering online. Actually ordered from a company in the Houston area – Comp-Tac. I ordered the Minotaur. I was amazed the first time I put the holster on at how the gun just disappeared. First time I tucked my shirt in was awesome. But everything isn’t sweetness and light. You end up messing with it a good deal to figure out where on your hip it should sit. Forward, backward, right on the hip bone. It can poke you or cut off circulation if you don’t have it set right. Appears there is a vein or artery that runs down your hip right there. The position isn’t the same for sitting or standing either, so you shift it. But it isn’t hard to make these small changes. Another thing is your belt has to be tight, which can be a little uncomfortable sometimes. Lastly even with the sweat guard, the grip of the gun does rub some. Weighting a little less and having less dunlap disease will probably help with that. In conculsion, an IWB is a huge leap in concealability without dictating as much what you wear. It is at least a holster you should keep around for some occasions. I recommend the Minotaur and Comp-Tach. They were much faster than they suggested when I ordered. Under promise and over deliver. I have IWB holsters for my P99 and my CZ P-01. I just got the one for my CZ last week, and gave it a workout this past weekend. I typically wear untucked shirts, so the tuckable isn’t as important for me. I’ve read lots of favorable reviews for Comp-Tac in several forums and blogs, but I don’t care for the way they look. They do look strange – kind of like a leather stingray – and they are pretty big, stretching around your hip. But that seems to be a form following function. It looks kind of like the Tucker Answer, which featured the front kydex piece of a Comp-tac CTAC that was mounted to a leather backing. I tried the “answer” but didn’t really care for it. Interestingly enough, it looks like Comp-Tac is the only one carrying this model as I haven’t found a Comp-Tac dealer that can carry it. I may give it a try here in the next few weeks.